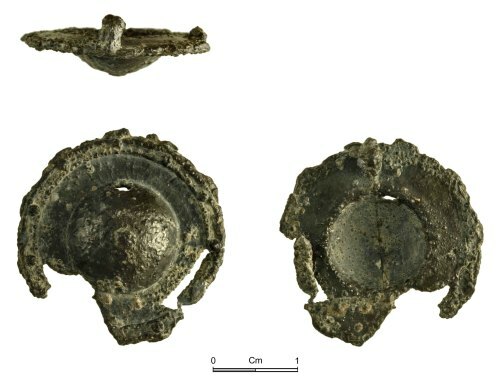 The badge is of circular, umbonate form and is incomplete, missing the pin and part of the rim (with a diameter of 26.4mm, a height of 6.1mm and a weight of 4.6g) probably representing a buckler. The outside of the rim is raised with a double-moulding, enhanced with raised pellets. The positions of the raised pellets corresponds with stubs around the edge, possibly from a larger openwork badge. At the centre is a raised boss (12.6mm diameter and 4.8mm high) with the possible suggestion of a pellet at its apex. The rear of the boss is hollowed. On the rear of the rim is the stub from an integral pin (3.5mm high and giving an overall depth of 8.5mm), which appears to have broken across the perpendicular bend. The position of the pin corresponds with a casting seam, discernible along the rear of the boss. No other markings are discernible on the rear and there is no applied decoration on the face. The surface has a dark-grey patina. Although it is now uncertain what the badge may represent, it is possible to suggest a buckler with a riveted edge. Bucklers are represented on pilgrim badges associated with Thomas Becket and can be broadly paralleled with two examples in the Museum Of London Collections , dated to the 14th century. Both examples have the buckler at the centre of an openwork panel. The edge stubs on this example may hint at a larger badge. The MOL badges also have the perpendicular integral pin at the edge of the buckler, similar to this example.